Once upon a time, a lovely friend gave me the cutest little sprout of a lemon tree. With a level of anticipation similar to “Jack and the Beanstalk,” I found great joy observing the seedling as it grew taller, leafier, and sturdier! When military orders came along, I followed advice from a local garden center on how to prepare the young tree for our cross-country move. 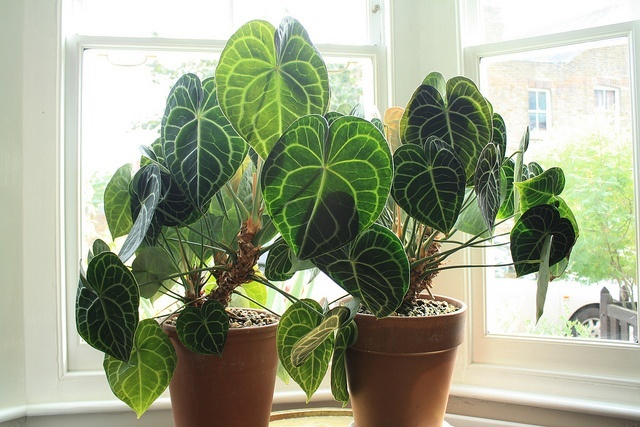 Wondering what to do with your own houseplants when it's time for a military move? Scroll through this post for a few suggestions and stories. Be careful with temperature changes. In warm weather, pack the top of the flowerpot with sphagnum moss. This will help hold the potting soil in place in case the pot would tip over in transit. Make sure the plant has adequate water. The layer of sphagnum moss will help retain moisture. Open the windows for ventilation if the plant is left unattended in the vehicle on a warm day. In chilly weather, keep the plant from cold air. Wrap the plant with newspaper as insulation. Load the plant into a warmed vehicle, preferably a vehicle parked in a garage. After several long days of travel, the little lemon tree was in better spirits than my spouse and I! Then, as we neared the state of California, the unthinkable happened! (insert dramatic music) The roadway merged into a checkpoint operated by the California Department of Food and Agriculture. All vehicles transporting any type of fruit, vegetable, or plant must be inspected. Due to the need to keep the steady flow of traffic moving, the inspectors had no time for sentiment. Long story short... there was no happily ever after for my little lemon tree. The California Department of Food and Agriculture Plant Health and Pest Prevention Services offers two main points to save time when passing through an inspection station. 1. Declare all fruits, vegetables, and plants for inspection. Ensure the driver knows what is in the vehicle and where it is located. Ensure the driver has keys or knows the combination for all door locks. Ensure all doors (especially those of self-move trucks and trailers) may be easily opened and closed. Although it may seem harsh to lose your favorite greenery, safety regulations are in place for a reason. The state of California is bordered with mountains, desert, and ocean. If anything new is introduced, it may cause havoc on the unique environment within those borders. On a similar note, if you have military orders to California or another state with similar regulations, your moving company may insist that any yard and garden equipment is power washed or thoroughly cleaned before shipping. Preventing contaminated soil or outdoor residue from entering The Golden State helps keep ecosystems intact. No matter where you're headed, if you're traveling with plants you may want to check the state-to-state plant health regulations. The National Plant Board has a statewide directory online. If I may suggest, it may not be a good idea to sneak your houseplants into a moving box. For example, what if the avocados ripening on your countertop were mistakenly wrapped up with your kitchen goods by a busy packing crewmember? (It happens.) When that box is delivered to your new address, it turns out that perishable fruits and veggies do not enjoy spending time in a hot July moving van or freezing in a January storage crate. Who knew? Even if that hidden peace lily brings you zen, you would be in quite a pickle if your moving contract is revoked. Just to review, it may not be lawful to drive your plants to your next home and your mover may refuse to ship your plants, so, what can you do? 1. Pass along your plants to friends and neighbors. If sentimental to you, ask for periodic photos of the blossoms. 2. List the posies for sale on a Facebook yard sale group or on Craigslist. Use the money earned to buy new plants at your new address. 3. Be a “giver” at a local plant swap or offer them on Freecycle. 4. Donate your greenery to a school classroom. Some varieties of plants bring calming notions. Some plants even clean the air of impurities. 5. No matter if annuals or perennials, share your flowers with either a nursing home, assisted living facility, or a low-income senior housing community. Often, retirees enjoy light gardening chores. Residents in elder care facilities may take turns pruning and watering. Seeing the plants flourish may bring others happiness and a sense of purpose. Take the plant out of the pot. Prune back the top of the plant. Wrap the root ball in damp paper towels and cover with plastic wrap. Or wrap the root in newspaper and cover with a zip lock bag. Your goal is to make the shipment completely waterproof. It is important that no moisture escapes, for the benefit of the plant, and for the well being of the box during shipping. Place your shipping address inside the box before sealing it up. Mail in a timely manner – consider rush delivery or 2-day delivery. 7. Often easier said than done, it may be time to bid a fond farewell to your flowers. Vow to visit a popular garden center in your new area. Learn from a horticulture expert about which plants are best for the climate of your new neighborhood. When you arrive at your new assignment, as you look around your new abode you’ll most likely have an idea of where your household goods will go and what will fit. Along those same lines, once you are moved in and settled, you may have a better idea of what size of plants will work for your indoor and outdoor space. Consider this time of transition as a fresh start to decorate with whatever flora and fauna trips your fancy! Post is for informational purposes only and does not constitute legal advice. Consult your local and state ordinances. Image from Flickr user Clivid.